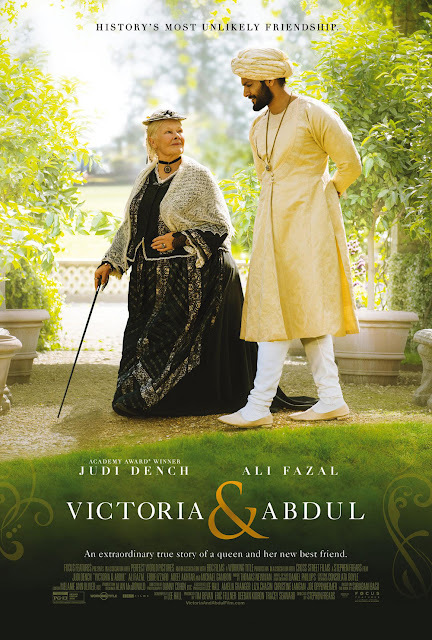 Home / ADAPTATION / History's Most Unlikely Friendship Blossoms in "Victoria & Abdul"
History's Most Unlikely Friendship Blossoms in "Victoria & Abdul"
Academy Award winner Judi Dench (Shakespeare in Love) reunites with Academy Award-nominated director Stephen Frears (The Queen), and returns to the role of Queen Victoria, in Universal Pictures' heartwarming drama, Victoria & Abdul. The screenplay is by Academy Award nominee Lee Hall (Billy Elliot), based on journalist Shrabani Basu’s book Victoria & Abdul: The True Story of the Queen’s Closest Confidant, which brought to light the long-hidden history of Victoria and Abdul from their own diaries and journals. In 1887, Abdul travels from India to present a ceremonial medal as part of the Queen’s Golden Jubilee but surprisingly finds favor with the elderly Queen. The unprecedented and unlikely relationship causes a battle royale within the royal household, pitting the Queen against court and family. Victoria & Abdul humorously explores questions of race, religion, power, and the farce of Empire through the prism of a highly unusual and deeply moving friendship. The film also stars Eddie Izzard, Adeel Akhtar, Tim Pigott-Smith, Olivia Williams, Fenella Woolgar, Paul Higgins, Robin Soans, Julian Wadham, Simon Callow, and Michael Gambon.